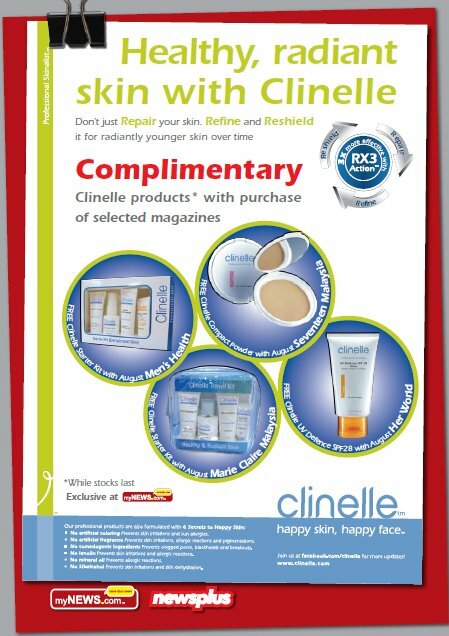 FREE: CLINELLE exclusive sample from myNEWS.com on purchase of August issue of Men's Health, Seventeen Malaysia, Her World & Marie Claire Malaysia! Don't just Repair your skin. Refine and Reshield it for radiantly younger skin over time. CLINELLE is giving out complimentary Clinelle products with purchase of selected magazines! EXCLUSIVE free gifts from myNEWS.com on every purchase of the August issue of Men's Health, Seventeen Malaysia, Her World & Marie Claire Malaysia!! Find out what CVT, ABS+EBD and Proton Ride & Handling means, and how it would benefit your drive.